I am unsure what to say in the wake of this book. Did I enjoy it? Yes. Do I think others will? It depends. First off, I’m really glad I never read the blurb until I was about to write this review, because Laura’s death hooked me right away, and if I’d’ve known about it in advance, well, I’m not sure when this narrative would have grabbed me. This is a book with layers; layers that you will either love or find annoying. I myself am vacillating between thinking it’s brilliant and pretentious. 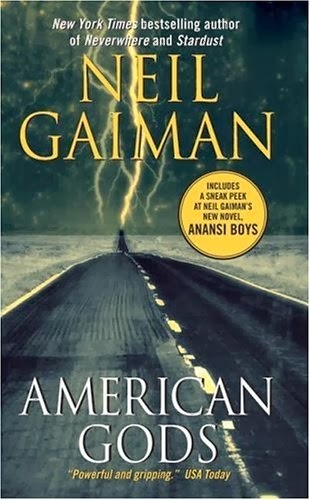 Neil Gaiman has been on my reading radar for years, and multiple times I was told to start with American Gods. So I did. It kept me interested through the entire narrative—some plot lines were more interesting than others, but I wouldn’t say I was left unsatisfied upon finishing the book. And I hesitate to call it urban fantasy, though it falls directly into the category. American Gods is larger than that, and sorrowful in a gritty, nostalgic way. Again: I enjoyed it. But I wonder: if I didn’t have a bit of knowledge of world religions and pagan gods (and I’m not saying I’m some scholar of the category, only that I may be more familiar than the average reader), I wonder whether I would have understood some of the underlying themes of this book. I suspect it would leave the reader with a hunch that there was more going on, but likely without the drive to research exactly what that may be and therefore that same reader would be left an unsatisfying read overall. This is why I’ve given it the rating I have: 3.5/5. I suspect American Gods relies to heavily on the reader bringing much to the table in order to understand its layers in full; that knowledge of world religions, gods, and pagan rites will allow the reader to make natural leaps within the narrative, but without that same knowledge the reader will be left hanging. At the same time, I wouldn’t have Gaiman change it—I hate when an author is too blatant with their themes or condescends to their audience, but I can’t help but feel there’s a happy medium here that has been missed. It’s why I think it’s pretentious: it’s written for those in the know. If you’re not cool enough to have an inkling about other religions, you’re going to miss out on all the awesome hanging in front of your face because you’re not cool enough to get it. Did I enjoy it? Yes. Do I think people will enjoy it universally? Well, I think I’ve already answered that. Will I read more Gaiman? For sure. Suggestion time: where do you think I should start? you articulated very well how I felt about the book. I agree. I remember when I finished the book thinking that I had understood some parts much more than others and that he asked the reader to do a lot of work. My lord, woman, you should have listened when I told you to PUT THE EFFING BOOK DOWN and pick up Neverwhere instead. I wash my hands of you. No I don't. That's a lie. You can't quit me. Muahahaha!